COMPANY PROFILE Rightmove PLC operates in the UK residential and commercial property industry connecting people to properties. Its activities include resale and lettings property advertising services & advertising services to new home developers and housing associations. Rightmove PLC is a U.K. property portal that provides online property search platforms. The company’s customers primarily include agents, buyers, renters, and new home developers. Rightmove provides users with tools such as the house price index, which tracks house prices and analyzes price trends in the U.K. house market, and a mortgage calculator, which estimates mortgages and monthly repayments. The company’s segments include agency, new homes, and other. The agency segment provides resale and lettings property advertising services. The new homes segment provides property advertising services to new home developers. The other segment includes overseas, commercial property, and nonproperty advertising services. 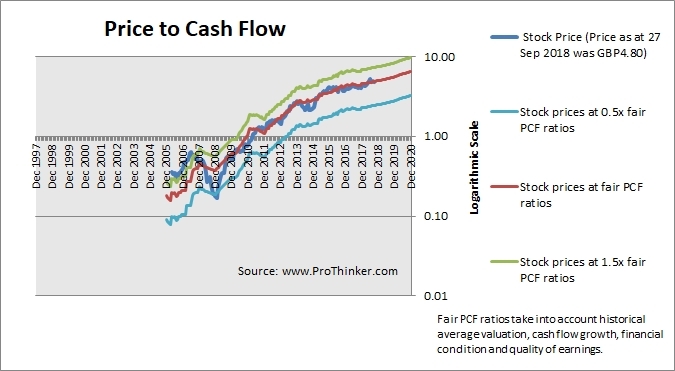 At the price of GBP4.80 as at 27 Sep 2018, Rightmove Plc is trading at a Price to Cash Flow Ratio of 27.3 times last 12 months cash flow. This is a 1.6% discount to current fair Price to Cash Flow Ratio of 27.7 times.